Not all fine art is in museums or galleries. These two seniors found other ways to enjoy fine art up close. 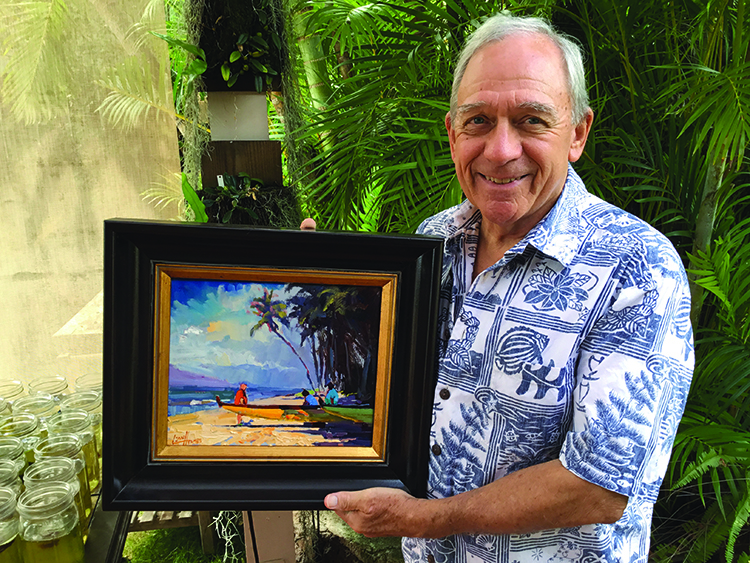 Both have a connection to the Maui Plein Air Painting Invitational art event on Maui — coming up Feb. 16–24, 2019. 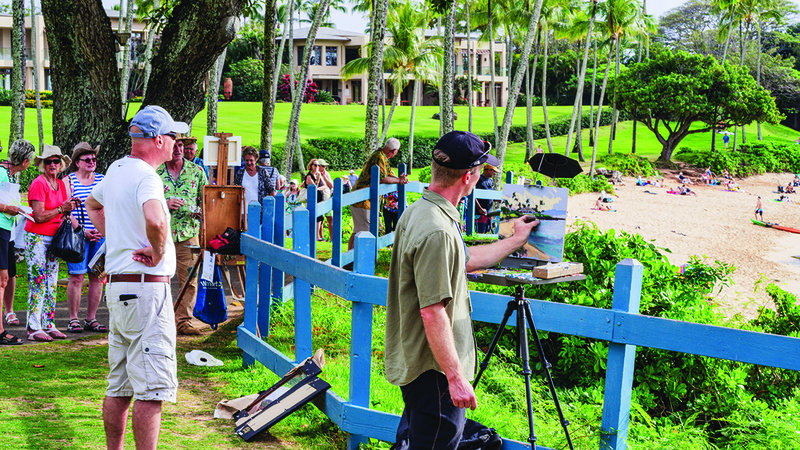 Spectators gather to watch plein air artists create their magic. Plein air is French for “outdoors.” Impressionist painters like Monet and Renoir attempted to capture the mood of a scene, including weather and time of day. Today, artists paint plein air landscapes in less than four hours, before the sun moves on. The paintings inspire memories of breezes, sounds and fragrances. 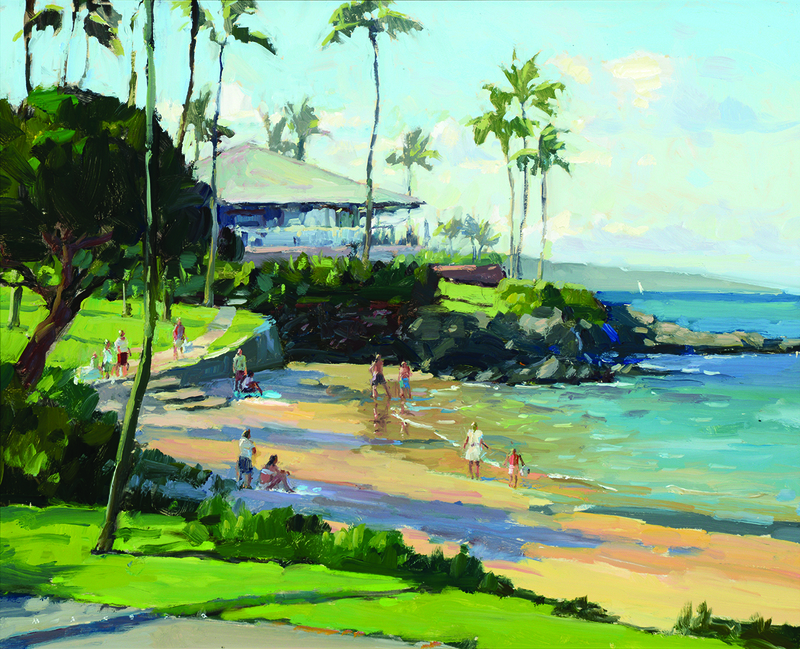 Every February, Maui Arts League assembles 25 award-winning plein air artists from Hawai‘i, the mainland and Australia to paint scenes of Maui and sell the fresh originals. 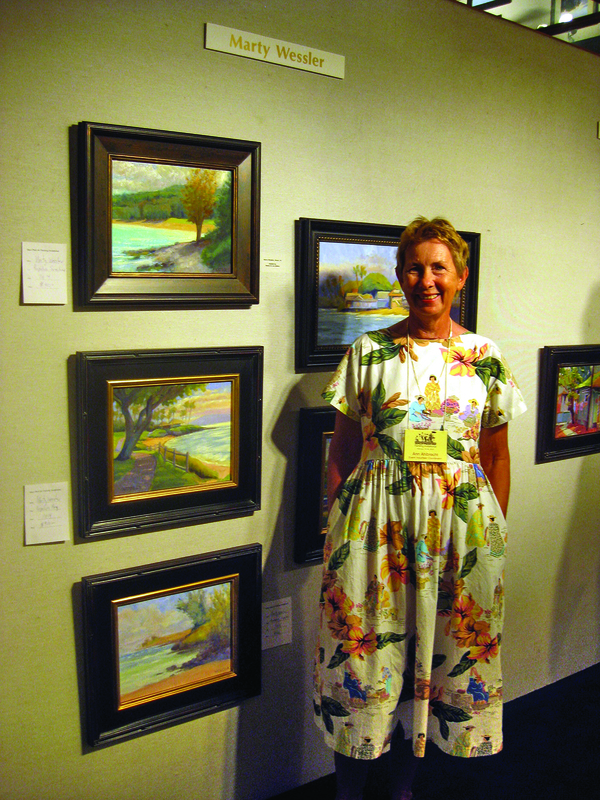 Ann Ahlbrecht volunteering at one of the annual MPAPI gallery events. Working the event allows her plenty of time to study and enjoy each painting and meet the artists. As an art lover, Ann wants every family to have the opportunity to experience fine art. Ed Bartholomew with one of his favorite paintings. Ed Bartholomew of Lahaina is a retired high school and UHMC biology teacher. These days he sells his own paintings at Lahaina Art Society Gallery and collects art. One of Ed’s favorites is “Man in the Boat” by Leon Holmes of Perth, Australia. “Wow!” says Ed as sunlight hits the canvas. “This painting still grabs me — that’s why I decided to buy it. It inspires me. Ann and Ed discovered two ways to support their community through art, and enjoy the talent of our Hawai‘i artists. Visit an art museum, gallery or event — maybe invest in an original oil, watercolor or pastel that “grabs” you.